If you can't tell by this recipe, I am SO ready for warm weather! I'm officially over chili and soups, and ready to spend summer nights by my parent's pool with a big plate of BBQ from our favorite local spot. Since we're not quite there yet, I'm channeling some major summer vibes in this recipe that I came up with over the weekend! Sean and I have pretty much eaten out every night since Em was born ... Postmates is a VERY popular word in our house. It's just way too easy to type in what we want on our phone and relax until dinner is delivered to the front door. It may sound like the life, but there's only so many times you can order from the same few restaurants until you start to feel a little burned out. I'm so stoked to start creating in the kitchen again! Not to mention that I know we're going to feel SO much better when burgers and chicken fingers aren't on our go-to menu on a regular basis. 😅 I have to say though, I think our weekly sushi nights will definitely be sticking around. I mean, sushi delivered to the front door ... it really doesn't get much better than that! Ok, now onto the recipe! 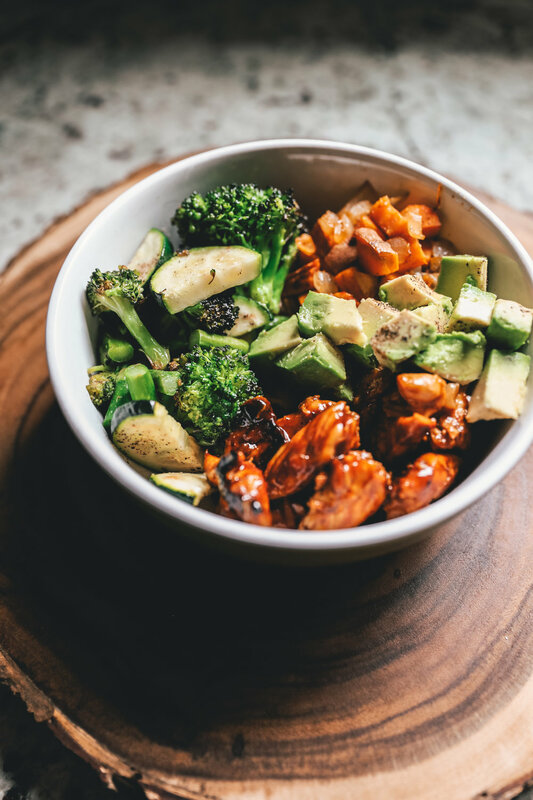 This healthy BBQ chicken bowl is the BOMB. For real. It's going to be my new go-to lunch (and dinner) for a while. We had it for lunch yesterday and today, and it tasted just as great as leftovers which is always a must when it comes to adding something new to my recipe box! The fresh avocado added on top makes it so that it doesn't feel like leftovers at all. 🙌 Oh, and if you're not a fan of BBQ chicken, you can totally use whatever your favorite marinade is for the chicken, or add quinoa to make it a veggie dish!